On Friday, November 23, 2018, the Sorensen School of Dance will continue its tradition of presenting an annual Christmas show fundraiser where we donate all proceeds to charity. This year we are debuting another NEW SHOW, “We Need A Little Christmas”!Join us for this very family friendly 90 minute show, tickets go on sale Wednesday, October 17th at 12 noon! This year commemorates our 9th consecutive year presenting a Christmas show! The show features the studio's Ballet, Tap and Modern Exam students along with our Junior, Elementary, Intermediate and Senior Performing Group dancers! The show is presented in honour of a former student of Sorensen School of Dance, Bethany Danielle Pike, who passed away in 2008. Over the past seven years, the studio has donated over $25,000.00 to various charities. The Christmas season is a wonderful time to reflect on how fortunate we are and give back to the community. This show helps celebrate the true meaning of Christmas and highlights our love of dance. Mark your calendar!!! The studio has been participating in the Downtown Santa Claus Parade for several years, most consistently since 2008. This event is a great opportunity for our Performing Groups to show how much we love to perform and to celebrate the joy of Christmas! 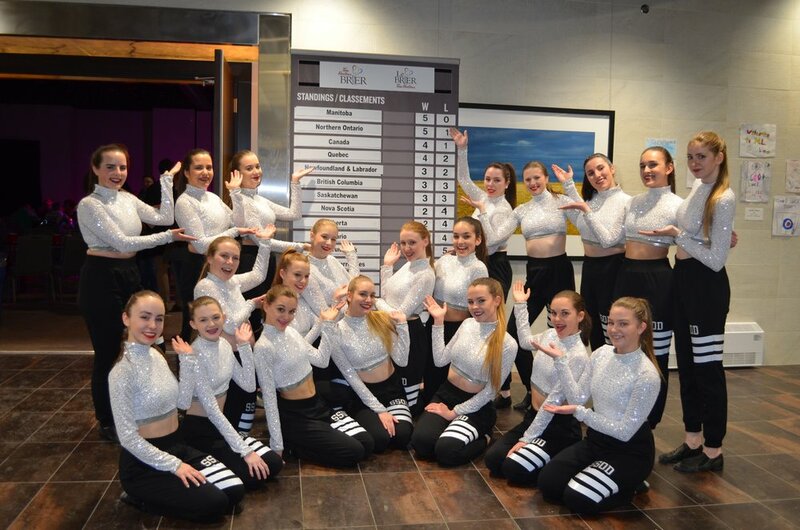 The studio has placed in the Best Performing Group Category (Dance) on several occasions, most recently as 3rd place in 2015! We also placed 3rd in 2012 and 2nd in 2009. We look forward to participating in the parade again November 25, 2018!! March of 2017 was a very exciting time at SSOD as we were invited to dance at the St. John’s Brier. Our SSOD dancers performed as part of the pre-game on ice entertainment and in the Brier Patch. To have the opportunity to perform at this massive event was truly an honor and we loved the huge crowds and big energy associated with this National curling event. To cap it all off Team Gushue from NL WON!!! Each year the studio hosts a Halloween event. This year add SSOD to your trick or treating and drop by the studio for a Halloween treat. We will be welcoming all SSOD witches, skeletons, wizards, princesses and other scary and unusual characters on Sunday October 28th, 6:00-7:30!!! SSOD hit the streets of beautiful Downtown St. John's with our Flash Mob 2014! Over 100 dancers showed up to orchestrate the studio's first ever flash mob and it was a huge success. Supported by masses of family and friends, we finished our year with an awesome open air performance and everyone loved it!! Another great SSOD moment!!! Congratulations to The Hair Connection team on their 3rd place finish last night at the 2013 Fantasy Hair Show held at the Geo Centre!!! Hats off to Miss Kim H and Miss Megan for doing an awesome job in preparing the SSOD dancers who performed as part of this amazing team!!! We were so proud to be part of this high energy event again this year!! To the beautiful Statue of Liberty Model, Michelle Galway, and SSOD dancers Amber Furey, Emma Schwartz, Ava Gogal, Madeline Roche, Hilary Gosse, Clea Chapman, Meghan Curran and Emily Collis you were amazing!!! The high energy performance was fantastic and again this year the audience loved you!! We were all so proud!!! Congratulations To The Hair Connection On Their 1st Place Finish At The 2012 Fantasy Hair Show, Held At The Geo Centre On August 5!!! Hats Off To The Sorensen School Of Dance Dancers, Emily Collis, Meghan Curran, Hilary Gosse, And Christina Pretty, And Junior Dancers, Amber Furey And Sara Schimp, For The Fantastic Dancing With Nikki Sacuta, The Stunning Peacock Model!!! To Megan Fowlow And Kim Hearn, Your Choreography For This Event Was Excellent! Both The Audience And The Judges Were Captivated And You Brought The House Down!!! It Was An Awesome Experience And A Great Way To Kick Off The Year. Way To Go, Ladies, I Am So Proud Of You All!!!! Another Great Ssod Moment!! !